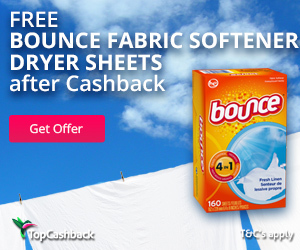 Unfortunately the "Free 160-Count Bounce Fabric Softener Dryer Sheets" offer is no longer available. 3. Add one (1) Bounce Fabric Softener Sheets, Fresh Linen, 160 Count priced for $5.97 to your cart and checkout. Do not add anything else to your cart. 5. In about 14 days $6.74 will post in your TopCashback account.